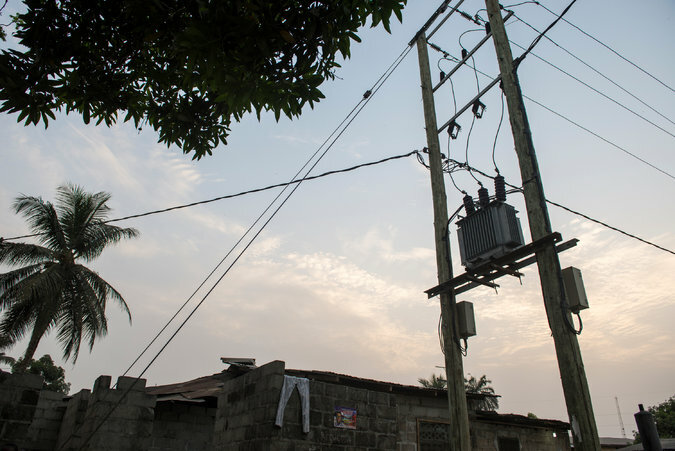 SAYON TOWN, Liberia — For the first time in 26 years, the electricity came on in Hayes Lewis’s modest house in this cluttered Monrovia suburb. The very next day, Mr. Lewis went out and purchased a television set, a fan and a single light bulb. The purchases cost him $250 — about a quarter of a year’s income for the 62-year-old jack-of-all-trades. “To have current, tha’ not small thing,” he said in Liberian English, motioning proudly at the light bulb in his bedroom. Except the light bulb was dark, the fan was still and the television screen was blank because the electricity, after making its much heralded return, had gone out again. 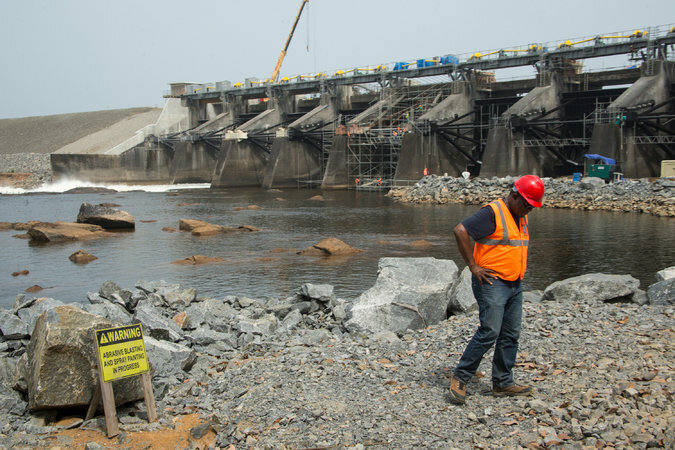 On New Year’s Day, a bandit trying to steal the copper wire from one of the light poles at the newly reopened Mount Coffee Hydropower Plant had electrocuted himself, prompting the shutdown of huge swaths of the system. Five days later, Mr. Lewis once again had no current. I asked him what he was going to do. Shrugging, Mr. Lewis trudged outside and put a large rectangle object on the table. “I wi’ use Chinese lantern,” he said, resignedly. After 26 years, the irony of the situation was beyond him. He supposedly had current, but he was still using the same makeshift battery light that had gotten him through the last two decades. But that is all par for the course here in this country that, 13 years after the civil war ended, is still trying to put back together the pieces that the war ripped apart. Fourteen years of war snuffed out 200,000 lives and laid waste to Liberia, producing generals who led ritual sacrifices of children before going into battle, naked except for shoes and a gun. By the time the war was finally over in 2003 and Charles Taylor was escorted out of the country, to eventually face a war crimes conviction, the country was left a shell. Schools were shuttered. What passed for a middle class had fled. Infrastructure was destroyed. And current was gone, taking with it running water, streetlights, and the simple assumptions of everyday life, including walking into your house and turning on the lights, or opening your refrigerator and getting a cold glass of water. Downtown Monrovia at night looked medieval; candles in shopfronts cast their dim light on the ribbons of dirty water running down the gutters. Liberians, as they have for decades, simply adapted. They acquired Tiger batteries, the lower-cost alternative to expensive generators, and used those to plug in their cellphones. Those cellphones they then used to light their way at night, as they traveled in the dark along rural roads and city streets. They bought so-called Chinese lanterns every other day. In Liberia, the phrase “Chinese lantern” does not apply to the silk-and-satin-covered red and gold lights that people string up at Chinese New Year. Instead, it is an ugly square or rectangular battery-powered light, the kind you might use at a campground at night. Even the wealthiest Liberians — those with access to generators — still hoard electricity as if it’s about to be taken from them. If you walk into the average Liberian’s house during the day, you will not find any lights glowing, let alone air-conditioners, fans, televisions, radios or refrigerators running. In fact, most Liberians with generators don’t have refrigerators; they have a deep freezer that they plug in for a few hours at night, long enough to get cold. Then they unplug it and keep the door closed, sometimes for up to two days, until they decide it needs another four-hour juicing. When President Ellen Johnson Sirleaf arrived at the Mount Coffee plant on a Friday in December to flick the switch that would officially signal the reopening of the plant, it was a big deal here. Flanked by Linda Thomas-Greenfield, the Obama administration’s assistant secretary of state for African affairs, Ms. Sirleaf was visibly buoyant, in no small part because, as she nears the end of her term in office, she was finally making good on an early promise from 2006 that she would get Mount Coffee up and running again. The United States, Germany, Norway and the European Investment Bank contributed to the $357 million project, which was delayed after the Ebola outbreak in 2014. Finally, last summer, neighborhoods like Mr. Lewis’s began getting hooked up to the electrical grid, in anticipation of the hydropower plant’s reopening in December. In Sayon Town, Mark Laffor, 30, was selling DVDs in his tiny stall, using the power of the same small generator that he has been using for years. He was supposed to be one of the people to benefit when Mount Coffee-supplied electricity, with its far lower price tag, returned. But he said his current lasted only a couple of days before going back out. “We were having current but they said the pole was destroyed,” he said, shaking his head in frustration. 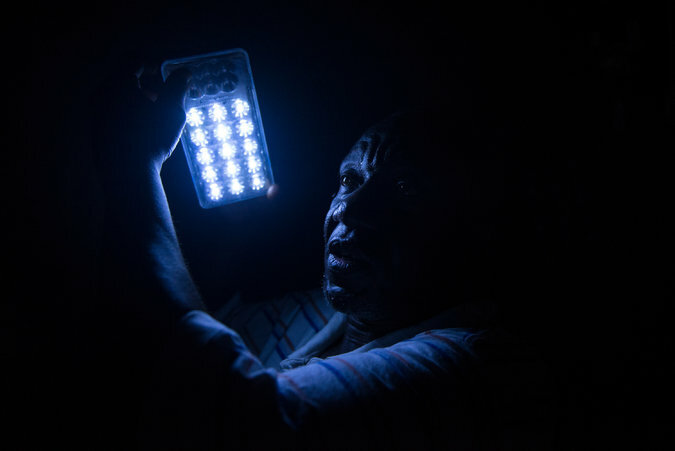 A few houses down from Mr. Laffor, 59-year old Nora Tabah, a market woman, proudly invited me into her home to show off the single light bulb she had recently installed in the hallway. “For years I was living in darkness,” she said. She was still living in darkness. Like Mr. Lewis, her current had gone out after a few days. But Ms. Tabah, who sells farina and kola nuts in front of her house, expressed optimism that things were about to change. “I ‘coming buy freezer,” she said. Hedrick Walker, 24, owns a shop in Sayon Town that sells “yama yama” — water, biscuits, Spam, Coca-Cola and the like. He said both his life and the town had changed now that Mount Coffee had come back on. “It’s more lively now,” he said. “I used to close at 6 p.m.” when the sun goes down. “Now,” he said proudly, “I am open until 11 p.m.” — at least on nights when the electricity is on. 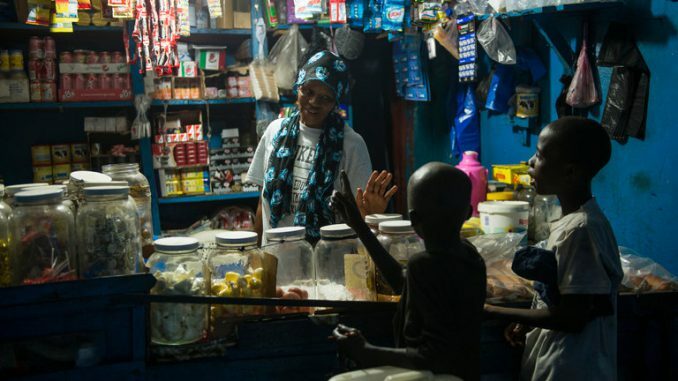 A few miles away, at Raymond Camp, just outside the Mount Coffee plant, Fatu Quay, 32, sitting at a table in her house that also serves as a shop, said that she was hedging her bets on electricity in Liberia. She spent $15 in December to purchase electricity when the power plant came online, and was pleased to see that two weeks later she still had money in her account. “But then the current went out,” she said, grinning. Quickly she switched back to the expensive generator that, for about $300 a month, has provided her with electricity at night, adding that she has no plans to get rid of it anytime soon. Like most Liberians, she said she didn’t use electricity during the day. But she is hoping that the cheaper Mount Coffee-supplied electricity will return before her aunt comes to visit this month.